So you buy a Webs-a-gogo website. You have a great design. You have all the tools you need. You're ready to get started. So just what does your new website have to offer that will help you rise to the top of the world wide web virtual pile while making a great impression. With our all-inclusive service & pricing philosophy we always do our best to include ( at no extra charge ) ALL the stuff you actually need to make an lasting impression with a high profile website that performs at the search engines.. Remember the old saying..."It's in there"? Well here's another one..."Your Success = Our Success"
At Webs-a-gogo we believe in order for us to succeed, you must succeed. So look below at the ever growing list of INCLUDED features, functions and services we have packed into every Webs-a-gogo Module Website (WAG-MOD). Just check out some of the stuff in our WAG-MOD offer these days. CONTROL: As you can see in the image at right, your Control Center is filled with possibilities. Use a few of the tools here or use them all. It's up to you. In any case you have complete control over your websites look and content. Our extensive Online Training System (OTS) together with our unrivaled support center will get you on the road to success rapidly. 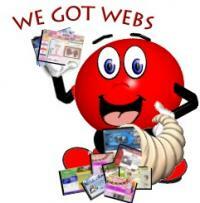 We even providfe each client with a specific member of our webstaff to become your personal web specialist. This kind of familiar support is rare in the web business. We know from experience, you will love it. a. Unlimited Press Articles (Web Pages): Press Article is the term we assigned as a content page or "web page". For your general text and picture web pages we utilize what we have termed as the "Press Article Page". Use this function to create and populate new and existing web pages such as About Us, Home page and others with text content and pictures, graphs, tables or whatever you need. Press Articles can serve as stand-alone web pages and as Featurettes which function to provide content editing on Non-Press Article "Pages" ( such as the header information on Link page, Contact forms, Subscriber forms, etc). Stated simply, the Press Article is your general purpose, do almost anything with it web page. b. Full e-commerce integrated hierarchical (Dept & Category) Product/Services Catalog: with Departments and Categories which supports thousands of products and services for sale online. d. Calendars: Unlimited and user editable. Use some for public access. Restrict some to access by staff members or clients. Versatile and customizable. Can also be used to notify staffers and clients of upcoming events by email. e. Catalog Gallery: Displays 1st Picture of each product service item in your website catalog. f. General Gallery: Unlimited pics with titles and descriptions. Can be enlarged with thumbnail selection and all pics can be emailed directly to a friend from the website. g. Mail-a-Pic feature: Email any pic from the website to a friend with a message with an embedded link back to the page you were on when you sent the pic. l. Mailing lists: up to 10k users each. These mailing lists are designed for subscriber based lists for visitors to your site. No spamming allowed. Only folks who have expressed an interest and have subscribed. m. Helpful Links: Helpful Links page provides links with pics to other resources on the web which offer support and info to clients. o. Color scheme editing: Global controls for site-wide editing of text, backgrounds, headers, borders, etc. t. eNewsletter: with auto feature to allow any press article to be automatically included in the e-newsletter. x. Client/Member Portal: Provides for Secure environment for clients and members to login to receive classified content, messages, purchase history and more. Excellent tool for communication and dissemination among staffers and members and clients. z. Featurette Article Feature: Every press article page can have another article inserted at bottom to plug another topic. cc. Guestbook: Allow your visitors and guests to make an entry to guestbook showing they were there. dd. Daily Backups on a 30 day cycle: Webs-a-gogo backs up your website everyday going back 30 days. This way if there is ever a mistake or data loss, we can go back as far as 30 days to recover your stuff.